The BenQ HT1070A at $599 is priced in the middle of the pack in this sub-$700 home theater roundup. What makes it a great value is its image quality for the applications it does best: traditional home theater and 3D. The HT1070A offers higher brightness than you would expect from its 2,200 ANSI lumen rating, which is tied for lowest rating in the group. However, when comparing video optimized settings, it is actually the third brightest, coming in at 1,071 ANSI lumens, compared to 927 ANSI lumens for the next brightest. It also scores well on image quality, with vibrant color and good black level, contrast, and shadow detail. For 3D, it also delivers good image quality and its brightness holds up better than some of the competition, which is one of the reasons it is a top pick for 3D. Its major shortcoming for other applications is its anemic built-in audio, which can be fixed easily enough with an external sound system. But it certainly has the lumen muscle for big screen home theater. Using its optimum video calibrations, the HT1070A is bright enough to fill as much as a 170" diagonal 1.3 gain screen in a dark room or a 100" image with moderate ambient light. The 1 year warranty includes an express exchange program and a full one year coverage on the lamp as well. Low Lamp Mode. Economic mode reduces brightness by 28% compared with Normal mode. Video Optimized lumens. The HT1070A's Vivid TV color mode is a good starting point for best image quality for film and video. With default settings, colors are a bit different from a reference projector in a side-by-side comparison, but turning Brilliant color off and adjusting hues yields better color accuracy while bringing brightness down only a little, to 1,071 ANSI lumens. That's still bright enough with a 1.3 gain screen to go as large as 170" diagonal in a dark room. Even with a 1.0 gain screen you can go up to 150". Video Performance. Three of the HT1070A's color presets--Cinema, Vivid TV, and Sport--are usable with factory default settings, so little or no calibration is required to get this up and running with enjoyable video. Side-by-side comparisons with a reference projector show a slight green or blue bias, depending on the mode, but not enough for most people to consider objectionable. Without something to compare to, you might not even notice any bias. Vivid TV has the double advantage of being the brightest of the three modes and having the closest to accurate color straight out of the box. The fourth mode--Bright--is the exception. Its green bias is obvious to the point of being impossible to ignore, and we couldn't find any settings that would make it neutral enough to consider acceptable for video or film. You might be willing to use it occasionally for a special occasion--like a party built around watching a big game--but it is not a good choice for day-to-day use. Zoom Lens Effect on Brightness. The 1.2x zoom is too little to worry about curtailing light noticeably at the telephoto end. Ignore zoom lens brightness as a factor when choosing a position for setup. Brightness uniformity. 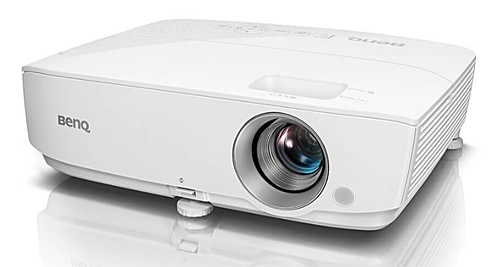 The HT1070A's measured brightness uniformity is 60%, which is low for a home theater projector in general, but a higher score than for all but two other projectors in this roundup. Input lag. The measured 33 ms input lag for the HT1070A is lower than many higher priced home theater projectors and many consider 33 ms good enough for gaming. However most of the HT1070A's competition offer a lag of 16 to 17 ms, which serious gamers will prefer for any game where reaction time matters. On-board Audio. The HT1070A's onboard 2W mono speaker delivers the lowest volume of any projector in this sub-$700 group. It is enough for only a small, quiet room. For permanent installation, you'll probably want to add an external stereo sound system with almost any projector, but with the HT1070A, you should plan on using external audio even for most ad hoc temporary setups. Fan Noise. The HT1070A's fan noise is typical for the projectors in this roundup. In Normal power mode, it is loud enough to notice even in a room with ambient noise, and be potentially bothersome as well. In Economic mode, it is still loud enough to notice in quiet moments, but few people will consider it intrusive. Throw distance. The throw distance for the HT1070A's 1.2x zoom lens for a 120" diagonal, 16:9 image ranges from 11.9 to 14.3 feet. You can find the throw distance range for the image size you want by using the BenQ HT1070A Projection Calculator. Lens offset. The lens offset is suitable for installation in a ceiling mount or placement on a table or on a low bookshelf in back of the seating area. With the projector sitting on a table, the entire image is above the lens, with the bottom line of the image about 7% of the image height above the lens center line. You'll want to avoid placing it on a shelf that's high enough to force you to tilt it down to hit the screen. Setting it that way would require keystone correction, which can slightly soften a 1080p image and add artifacts to fine patterns in an image. At $599, the BenQ HT1070A is a solid value and a strong contender among sub-$700 home theater models, particularly for traditional home theater and for 3D. For home theater, it offers vibrant color and scores well on black level, contrast, shadow detail, and maintaining sharp focus across the entire screen, all while offering a higher brightness level for video optimized settings than most projectors in this roundup. The HT1070's low official 2200-lumen rating can be ignored since in practical use it is brighter in good video modes that many of its competitors with higher lumen ratings. is bright enough for as much as a 170" diagonal image with a 1.3 gain screen in a home theater, or a 100" image with moderate ambient light. And if you're comfortable using slightly less accurate--but still realistic-looking--color, the default settings for the Vivid TV mode boost brightness to 1,272 ANSI lumens, which can drive up to a 215" diagonal 1.3 gain screen in a dark room or a 115" image with ambient light. For 3D, the HT1070A has a typical drop in brightness, which still leaves it brighter than some of the competition. It also lets you adjust the image settings, which some models in this roundup don't allow. For other applications--family room TV substitute, ad hoc setup in different locations like a backyard movie night, and gaming--the HT1070's low audio volume is its key limitation. But if you already have or are willing to buy an external sound system to go with it, that problem goes away. The 33 ms input lag is another limitation for gaming by today's standards. Most of the competition boasts roughly half that lag. But keep in mind that it wasn't long ago that 33 ms was considered fast for a projector. Taken together, all this makes the BenQ HT1070A a potential choice--despite limitations--for family room TV substitute, moving to various locations, and to a lesser extent for casual gaming. But it is one of our top picks for both traditional home theater and for 3D.